Every successful backup job session creates a new restore point that lets you roll back VM data to an earlier point in time. To control the number of restore points in the backup chain, you must specify retention policy settings. The retention policy defines how many restore points you want to retain on disk and thus how ‘far’ you are able to roll back. After the allowed number of restore points is exceeded, Veeam Backup & Replication automatically removes the earliest restore point from the backup chain. 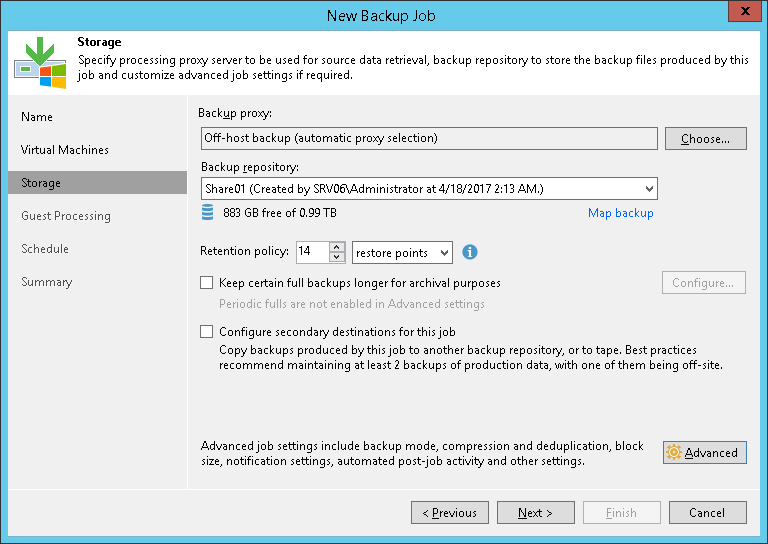 To define the retention policy for a backup job, you must specify the necessary number of restore points in the Restore points to keep on disk field in the backup job settings. By default, Veeam Backup & Replication keeps 14 restore points on disk. When the allowed number of restore points in the backup chain is exceeded, Veeam Backup & Replication deletes the whole backup file, not separate VMs from it. For more information, see Removing Restore Points from the Backup Chain.